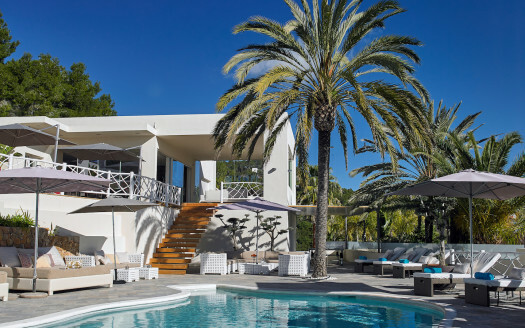 Overlooking the beautiful countryhouse of Ibiza and distant the Mediterranean, we recommend you Can Nina, a luxury villa to rent close to Ibiza town and San José. The style is contemporary with a a vintage and cosy style, with terraces and comfortable living areas. The location is excellent close to Ibiza, Cala Jondal, San José ! Open-plan living area with TV, study/library place. Sliding doors open onto the terrace. Master bedroom 1 with King-size bed, TV. There is separate dressing and bathroom with a shower, bathtub, toilet. The bedroom opens onto ground level terrace. Bedroom 2 has a King-size bed and ensuite shower room. 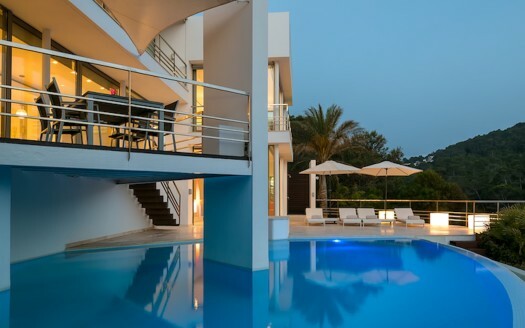 It opens onto the pool terrace. Bedroom 4, with ensuite shower room and opens onto the pool terrace. Master bedroom 4 has a King-size bed, living space and a shower room. This room is set in separate building, with a private entrance. It opens also onto a terrace. Fully enclosed grounds with electric gates. Carport for 2 cars. Covered terrace with alfresco dining table comfortably seating 8, a lounge area with sofa-style seating. Garden level: Pool deck with 4 sunbeds, sofa and a dining table with umbrellas. Pool 12 x 5, with seas salt and oxygen system. Music system with IPod connection. Alarm system incl Panic button. Can Nina is set on a hillside between Ibiza and San José. Ibiza Town and San José (Sant Josep) are just 8 minutes away by car. The drive to/from the airport takes only 5 minutes. The nearest beaches are Cala Jondal, En Bossa, Es Cavallet, Salinas. Only 5 minutes away an excellent organic food market “Cas Costa”.